Since Tales of Symphonia, combat in the console Tales games has been largely the same (though with a few admittedly unique features in each one). But the newest game, Tales of Zestiria, has several changes that, while small, alter how the battles work on a fundamental level. The most major change is the abandonment of a traditional RPG magic system. In past games, your special attacks used TP (Technical Points). TP was restored by consumable items, special equipment, food, or visiting an inn. In Tales of Zestiria, however, your characters recover their TP naturally. By standing still or defending, characters can fully replenish their TP in under 10 seconds. The trade-off to this is that now even normal attacks in Tales of Zestiria use TP—and many have elemental properties as well. Because of this, the flow of battle has changed drastically. Before (if you were like me), you would often use only a special attack or two per battle (so as to conserve TP) and largely make due with an endless stream of normal attacks. With the new system you are encouraged to go all out, using the most effective special attacks you have against the enemies. Then, when you run out of TP, you switch to the defensive—blocking and dodging until you are ready to go again. The other major change is the camera placement. In battle, the camera has always been placed somewhat at side view—reflecting the original Tales of Phantasia battle system. This means that pressing left or right would bring you closer to or further away from an enemy while up and down would make a character jump and duck. In Tales of Zestiria, the camera is now placed behind the character you are controlling. Pressing up brings you closer and pushing down takes you further away—as, confusingly, so does pressing left or right respectively. Jumping and ducking are no longer part of battle (outside of special attack animations, anyway). 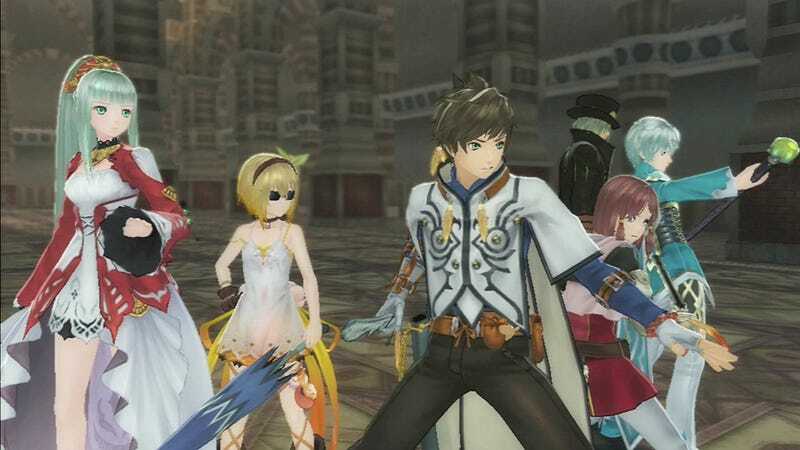 Of course, there are a few more superficial additions to Tales of Zestiria's battle gameplay as well. You are able to swap characters mid-battle with just a press of a button—something more than a little handy when attacking elemental weaknesses is key to victory; and the characters in your party are able to merge with one another to create super powerful combinations as well. Personally, I have found these changes enjoyable for the most part in the twenty hours I have spent with the game so far. The game has less downtime between battles (as in-battle healing should sustain your party easily); and battles always require a bit of strategy as to when to attack and when to focus on regaining your TP—as well as on how best to utilize the fusion forms. Here's hoping it continues to work this well in the latter half of the game.